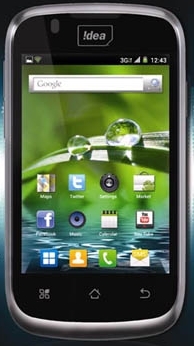 Leading Telecom operator Idea cellular has launched new Android 3G smartphone in India at affordable price tag of Rs. 5,390. It is a dual-SIM (GSM+GSM) supported smartphone. Idea offers free 3G benefits worth Rs. 1200 with this smartphone. Zeal come with 3.5-inch touchscreen with 320X480 pixels screen resolution and it runs on Android 2.3.6 (Gingerbread) operating system. It come with 1 GHz powerful processor with 256 MB RAM. Currently most of the smartphone come with up to 512 MB RAM but Zeal has only 256 MB of RAM but it available at low price tag. For capturing needs it built-in with 3.0 Megapixel autofocus rear shooter camera with Digital Zoom. This smartphone mainly targeted to collage students and professionals who like to stay on social network sites and access e-mails easily. 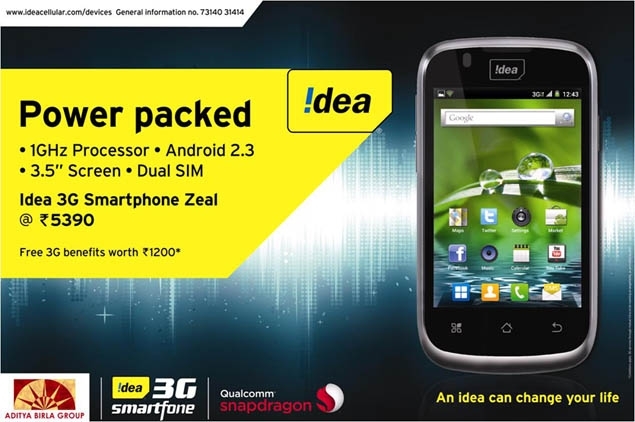 Idea Zeal features connectivity facility via 3G, Wi-Fi, A-GPS, and Bluetooth. Zeal built-in with a MicroSD card slot, it support up to 32 GB external memory.